"Warm Your Corn" Ready-Popped Gourmet Popcorn you can Warm from Popcorn Indiana - Frugal Mom Eh! As a child I always looked forward to “treat” nights where we would get a small cup of pop and my dad would make up a big bowl of air popped popcorn complete with salt and butter for us to share. It was a once a month type of event in our household which is made it that much more special. As an adult, popcorn is still one of my favourite evening snacks. There is just nothing better than getting cozy on the couch with my family, a blanket, a movie and fresh, hot popcorn! Unfortunately I no longer live with my parents, and I’m not so great with the popcorn machine or even microwave popcorn. (Why does it always burn?) 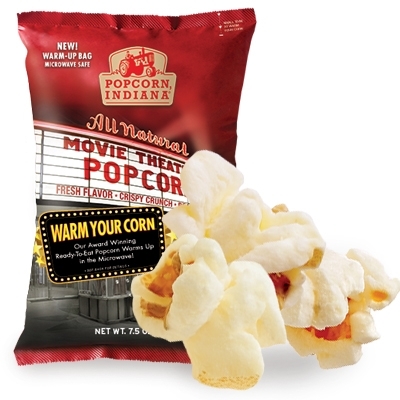 Thankfully, Popcorn, Indiana recently sent me a bag of Warm Your Corn: Original Movie Theatre Popcorn to try out and man is my life changed for the better! The magic is in the bag!Simply make a tear in the bag where indicated, and place the ready-popped gourmet popcorn in the microwave to warm. 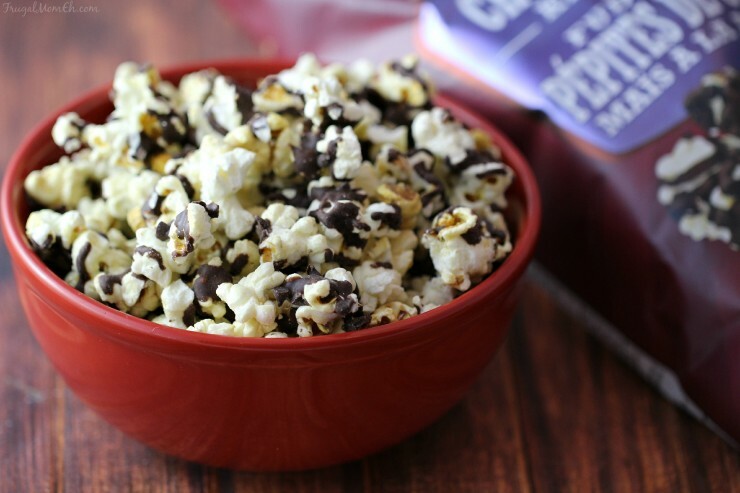 In 50 seconds you will have piping hot, crunchy, fresh theatre-style popcorn at home. First, I just have to say it; I loved that my popcorn didn’t burn. I have to admit that I was nervous about that. I don’t have the best relationship with my microwave so I was quite pleased. The popcorn does come popped and ready to eat – and it does taste quite good straight from the bag. However, heating it up brings the popcorn to a whole other level. It literally took me back to my childhood and the smell and flavour of that freshly popped popcorn my dad would make us. Warm your corn is still made from non-GMO corn, without added preservatives, colourings or artificial flavours just like Popcorn, Indiana’s other great popcorn varieties. Speaking of which… you need to try the Chocolate Peanut Butter Drizzlecorn or the Dark Fudge Chocolate Chip Drizzlecorn. Amazing and seriously addictive! Popcorn, Indiana prides itself on artisanal popcorn craftsmanship. First, the popcorn is hand-crafted in kettles and then given the VIP flavour treatment. Flavours range from savoury to spicy to sweet, and are devised by “popcorn chefs” with a wholehearted approach to creating unique and mouth-watering flavour combinations without artificial flavours or colours. For those looking for a lighter snacking option, Popcorn, Indiana also offers FIT. FIT popcorn features the same amazing taste and quality you are used to from Popcorn, Indiana but is only 40 calories or less and just 2g of fat per cup. It’s ideal for those interested in smarter snacking with flavours like Sea Salt, Extra Virgin Olive Oil, Parmesan & Herb and Onion Dijon have been approved by “The Biggest Loser” as snacks that can be part of a healthy lifestyle. Popcorn, Indiana can be purchased at a local retailer near you! Ooo I never thought to heat this up! Sounds delicious! They stopped this option. The bag would catch on fire now.. So sad because it was very good warm.